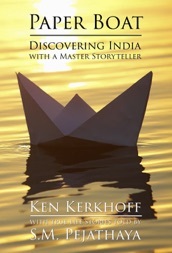 Paper Boat: Discovering India with a Master Storyteller by Ken Kerkhoff and S.M. Pejathaya is available in both paperback and ebook. The book is available online at Amazon and many other online and brick & mortar stores.